During next week's regular meeting, the Elk Grove City Council will discuss the referendum seeking to reverse their October 2016 vote releasing the Howard Hughes Company (HHC) from a development agreement on the unfinished shopping center called the Outlet Collection at Elk Grove. In a staff report released with today's agenda, the Elk Grove City Clerk's office has included as one of its recommendations that the City schedule a special election on Tuesday, June 6 to put the referendum before voters. Other recommendations included are to schedule the referendum for the next scheduled municipal election in November 2018, to rescind the October 2016 vote, or to defer the decision to a later date. The referendum, which was sponsored by Emeryville, California-based Knighted Ventures LLC, an operator of several area card rooms, seeks to reverse the City Council vote relieving HHC of the development agreement on the unfinished shopping center. 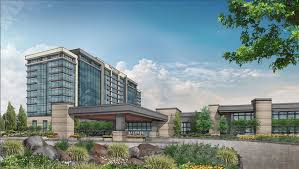 By releasing HHC from the development agreement, they can sell a 36-acre portion of their development to the Wilton Rancheria for their proposed $400 million casino resort and have it placed into federal trust. A spokesperson for Knighted Ventures said he was pleased that the City Council is initiating action on the matter calling it "a step in the right direction" and saying the people of Elk Grove should be able to weigh in on the issue. "All we have been asking for is the ability of the people of Elk Grove to weigh in on the issue," spokesperson Roger Salazar said. Salazar pointed to Thursday night's City Council decision to fill a council vacancy by appointment rather than holding a special election as demonstrative of the Council's unwillingness to take into account the will of Elk Grove voters. "It seems to me what we are seeing here is a government of the council, by the council, rather than of the people, by the people," he noted. Wilton Rancheria Chairman Raymond "Chuckie" Hitchcock said the tribe respects the City's actions but noted the federal government will be the final arbiter of whether or not the project proceeds. Salazar acknowledged that there are still many other governing bodies that will need to act on the casino proposal before the final decision is made, but said that local voices should be heard. "We have got to give the voters of Elk Grove the ability to have their say," he added. A SPECIAL ELECTION would be very costly. What they could do is make a temporary appointment and then at a General election put the referendum on the ballot.